For many, graduating from our BSc (Hons) Baking Technology Management degree with a First would be achievement enough – but not for Claire Toynton. 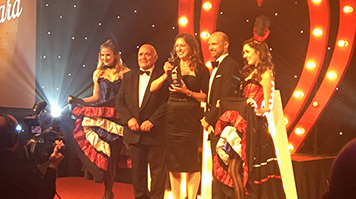 The gifted baker took her profile a few steps higher when she scooped the Rising Star award at the Baking Industry Awards 2016, beating the best of the British baking industry to pick up the gong. The judges had been impressed by Claire’s professionalism and determination, as she had undertaken a string of work placements, visits and internships alongside her studies. Claire used the contacts she made to gain experience through visiting and working in a huge variety of bakeries, flour mills, manufacturers and ingredient suppliers over the next three years of her course. “I was also interested in teaching, so obtained accreditation through STEMnet (Science, Technology, Engineering and Maths network) to volunteer in schools, teaching children about baking,” she says. I enjoyed every aspect of the practical side of the course, especially the product development module. Having free reign to create and innovate was amazing, and has shaped my career choices and ambitions since.